Uwa Ohiku has specialist experience in all aspects of IP law and practice, and is head of Jackson, Etti & Edu’s IP practice. She has received several accolades and has been appointed to various positions of leadership in her field. Ms Ohiku was the only Nigerian mentioned among the top 250 women in intellectual property globally in 2017 by Managing Intellectual Property. She was appointed as a member of the Presidential Enabling Business Environment Committee subcommittee to achieve quick wins at the Trademark and Patent Office in Nigeria. 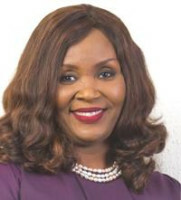 For many years, Ms Ohiku was the only Nigerian panellist at the World Intellectual Property Organisation Domain Names, Arbitration and Mediation Centre and she has adjudicated on many cases, including a domain name dispute involving a well-known cable news provider. In April 2011 Ms Ohiku was appointed by the Federal Science and Technology Ministry as a member of the committee of experts invited to review the draft science, technology and innovation policy for compliance with IP law. She drafted the terms of reference for an IP study for the Organisation of the Petroleum Exporting Countries R&D officials. Ms Ohiku was also appointed chair of the panel which reviewed the draft Nigerian Trademarks Act in 2002. She advised and produced a working paper for the government on the matter of Nigeria joining the African Regional Intellectual Property Organisation. She was commissioned by the former minister of trade and commerce to prepare a study on revamping the Nigerian Trademarks Registry. Ms Ohiku was named an IP Star by Managing Intellectual Property (2014-2017), an outstanding IP practitioner in Who’s Who Legal (2013-2015) and an IP expert in the Women’s Legal Network and Euromoney’s Expert Guides to the World’s Leading Women in Business Law 2015. In 2011 she was also nominated as one of Nigeria’s 50 most influential women in the legal profession by Businessday. Ms Ohiku is the southwest coordinator for the Africa Women Lawyers Association of Nigeria.